Consumer Electronics Show, Las Vegas, USA, January 5, 2017 – 50 per cent of people want to get back into shape in 2017, but don’t know what to do or where to start. Research commissioned by Jabra, part of the GN Group, shows fitness hopefuls are aware that training guidance is important, but simply aren’t seeking advice – either from professionals or peers. Almost three quarters (71 per cent) admitted to having never used a personal or group trainer and another 96 per cent aren’t prepared to do a basic search online for quick tips and video workouts. Gym-goers are becoming more critical of the traditional personal trainer too. Key pain points referenced were the expense of paying for their services and a tailored training plan – in addition to any monthly fees and gym contracts (18 per cent) and slow body transformations (5 per cent). Additional research also found that long gone are complex group workouts. Newfound fitness fanatics are replacing these with old ‘cardio led’ favourites – running, cycling and swimming – traditional forms of ‘solo’ exercise which build muscle, develop respiratory fitness and burn calories. Many are also opting for simplicity and a bespoke, personal workout, with one in five (18 per cent) considering an‘on-the-go’ fitness coach accessed through a smartphone. While working out in isolation can be tedious, hearables are seemingly becoming more popular with the new generation of fitness fanatics. Wireless headphones, popular digital music services and fitness apps (like the Jabra Sport Life App), provide a method to stay motivated and get in the zone. 81 per cent  of consumers report they like to work out with music. Favourite genres being pop (25 per cent), rap (9 per cent) and dance (8 per cent). “Understanding changes in the way people exercise has helped us develop innovative true wireless sports earbuds – devices that provide the essential training enhancement. What people are seeking from wearable devices is adapting – they want help and advice on their fitness journey more than they are looking for a simple step counter”, says Calum MacDougall, SVP at Jabra. 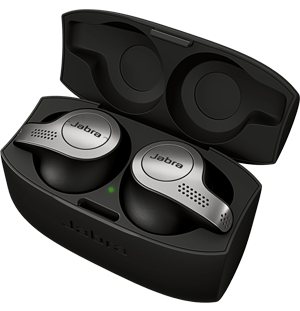 At CES, Jabra will present its range of sports headphones and earbuds. Enhanced further by the Jabra Sport Life app, each product aims to optimize your workout with your very own in-ear personal trainer. With live coaching or training tips, you can plan, drive and track all your personal training regimes whilst monitoring your pace, cadence, calories burned, distance covered and more. All while listening to music in crystal clear quality without the hassle of wires getting in your way. 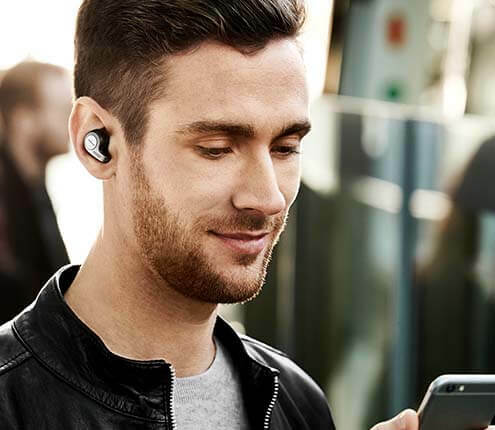 On the subject of wires, or cords, these have now been cut completely with the recently launched Jabra Elite Sport, making training easier and more hassle-free than ever before. These true wireless sports earbuds, positioned as the most technically-advanced available, serve as a true training aid. They deliver freedom of movement, ground-breaking in-ear fitness analysis, strong battery life and premium sound quality for anyone who wants music to work out. Jabra Elite Sport supports all major smartphone operating systems (both Android & iOS) and builds on Jabra heritage for excellent call quality. This is thanks to earbuds that analyze external sounds and automatically switch to the earbud with least background noise. These state-of-the-art earbuds deliver superior audio quality for calls and music without wires. As part of the GN group, pioneers in sound from sports headphones to hearing aids, Jabra continues to offer superior sound engineering and unrivalled expertise. Consumer research commissioned by Google Surveys, with 1,000 respondents taken from four international markets (USA, UK, France and Germany). 81% of 1328 respondents to a Jabra consumer survey, April 2014.